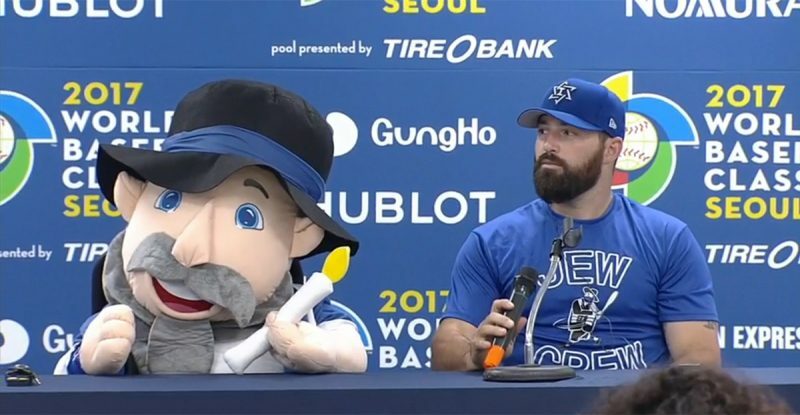 Team Israel's mascot - "Mensch on the bench"
Hat/Tip: To my brother Doctor Bradley B who sent me this great video regarding the amazing Team Israel baseball team who is shocking the world in the World Baseball Classic. The video was titled: "Israel's Baseball Team Wearing Kippot During Hatikva [the Israeli National Anthem]". My brother Brad quipped: "Off the caps, on the Yarmulke, during Hatikva." :-) TY IsraellyCool for this You Tube video. When looking at that video on You Tube I saw this other great video where 10 Jewish Major League Baseball players visited Israel in January, as Israel was preparing their team to compete in the WBC. From Arutz Sheva-Israel National News: "Ten Jewish Major League Baseball players will visit Israel in preparation for the World Baseball Classic, JTA reported on Monday. "The visiting players are former New York Met Ike Davis, Ty Kelly of the New York Mets, Ryan Lavarnway of the Oakland Athletics, Sam Fuld of the Oakland Athletics organization, Josh Zeid of the New York Mets organization, Cody Decker of the Boston Red Sox organization, Jon Moscot of the Cincinnati Reds, Corey Baker of the St. Louis Cardinals organization, Jeremy Bleich of the Philadelphia Phillies organization, and Gabe Kapler, Los Angeles Dodgers Director of Player Development." In the first video because they didn't play the full Israel National Anthem Hatikva ["the Hope"] and because it is so beautiful, I have it here. Just like their entire history of existence, the Jews and Israel underdogs, but let that not sway determination, will, and drive--- the strong and the righteous succeed in all phases of life, including the diamond!